Sugar Free Style: Tea time! The weather has been all over the place lately. For real - it's like 30 degrees one day and almost 70 the next. And while I'm all for enjoying a warm afternoon in January (there's a reason I left the Midwest and headed down South), it has wreaked havoc on my sinuses. I've had some wicked allergies the past couple weeks, complete with scratchy throat, sniffles, itchy eyes and chapped lips. Joy! Anyhoo, I'm taking Zyrtec and have been guzzling Emergen-C and water, but sometimes there is nothing like a hot cup of tea to take the edge off a bad cold. And fortunately for me, January just happens to be National Hot Tea month. 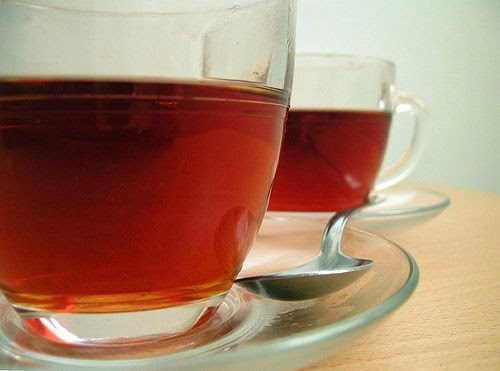 In keeping with the season, here are a few of my favorite sucralose-sweetened hot tea recipes. Samosas and raita and naan, oh my!